Publics in advanced economies are divided about the impact of trade on wages. A median of 31% say international commerce boosts wages, including 56% of South Koreans and 52% of Poles. A median of 27% believe trade lowers wages. And another 35% think it has no influence on paychecks. Adults in emerging markets are more likely to credit trade with boosting wages. By more than two-to-one they believe it leads to wage increases. This includes majorities in Kenya and India. 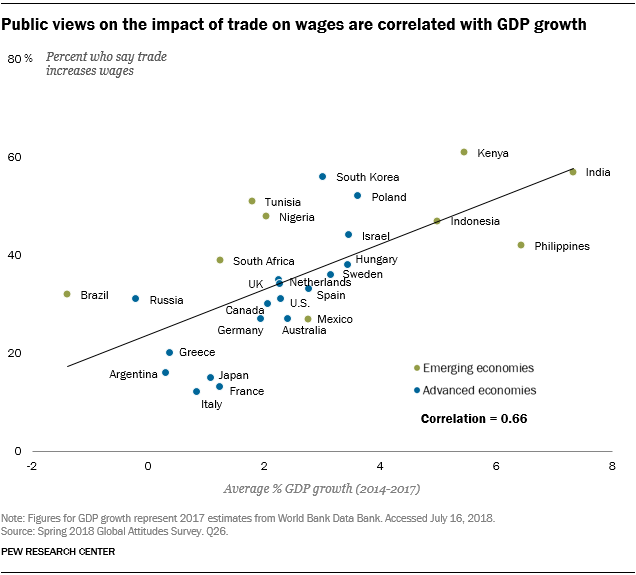 The recent performance of a country’s economy and the views of its public on the impact of trade on wages are related. The faster an economy grew on average between 2014 and 2017, the greater the likelihood that adults in that society hold the view that trade boosts wages. This is particularly the case in India and Kenya. In nations such as Italy and France, where economic growth has been slow in recent years, few members of the public believe trade leads to higher wages.